Please be advised that in our experience and observations, Phoenix Sylvestris has demonstrated an extreme degree of susceptibility to Texas Phoenix Palm Decline (TPPD). Because of the aggressive spread of this Phytoplasma disease in Florida nurseries and Florida produced Phoenix Sylvestris and, because in its earliest stages the disease does not produce any visually identifiable symptoms, as of 2018 the risk of delivering infected Sylvestris inventory has become outsized and Groundworks can no longer guarantee that the Sylvestris Date palms we deliver are free of Phytoplasma disease at the time of delivery. We do our best but we just can't be sure. As such and in accordance with our observations and experience, please be respectfully advised that infection and loss as a result of Phytoplasma disease is now a common risk inherent in using Phoenix Sylvestris and it is a risk that buyers assume when choosing to utilize Sylvestris Date palms. Groundworks OTC (Oxytetracycline) inoculates the Sylvestris we deliver and we strongly recommend that the inoculations be performed every 3 months ad infimum but under no circumstances will we replace or offer any credits whatsoever for losses of Sylvestris as a result of Phytoplasma disease regardless of when the palm(s) may have become infected. 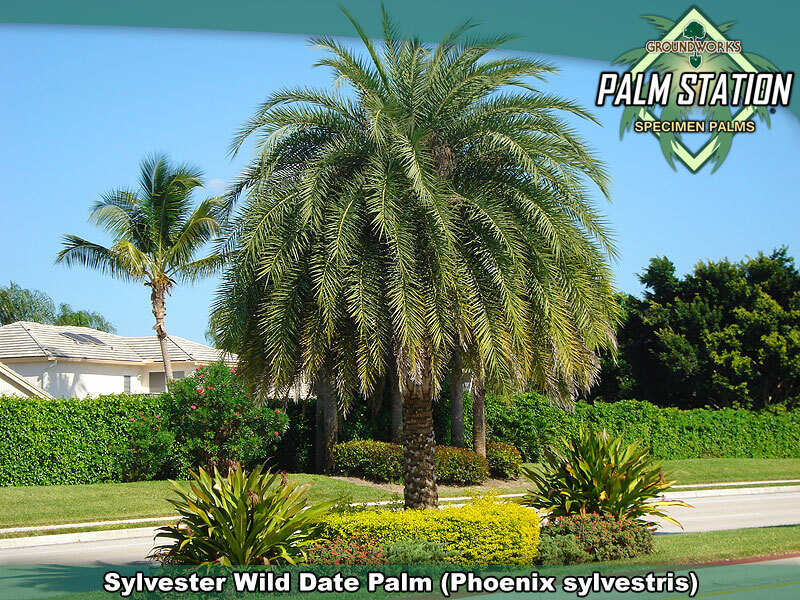 Also known as the "silver" or 'wild" Date Palm, Phoenix sylvestris, is a beautiful accent palm that blends well into many landscape themes. The trunks are robust and the canopies average 18' across at maturity. Sylvestris are all grown from seed and so its normal to see some variations in appearance across a group. With canopies that tend to vary in color from deep green to a golden hue and with fronds that vary a bit in length and structure, the use of this species in groups brings d a powerful degree of tropical diversity to the site. 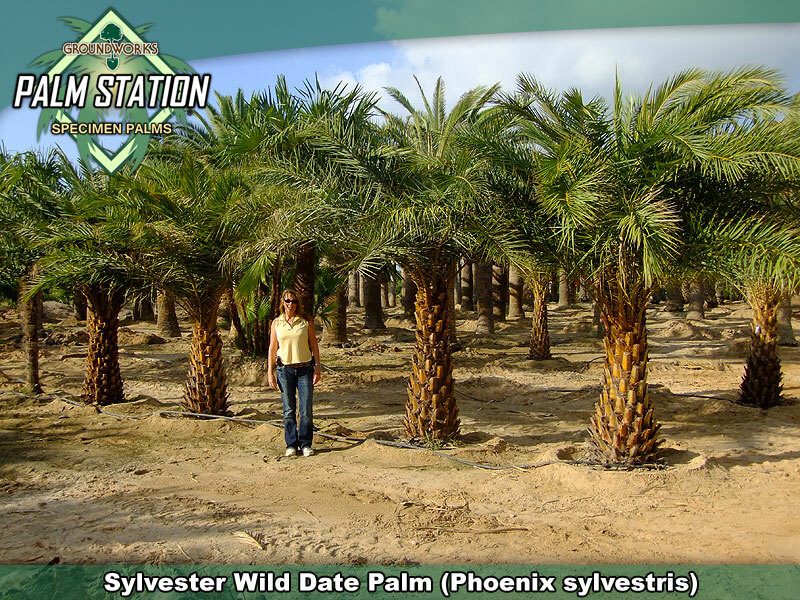 Sylvestris is relatively fast growing as Date palms go. This species, once established will grow at a rate of about 1.5 feet per year so starting a little smaller than might be ideal for the scale of the site is a good idea. The species is cold hardy down into the high teens and the canopy will show moderate to severe freeze damage after such freeze events but she recovers nicely and regenerates a new canopy during a single growing season. 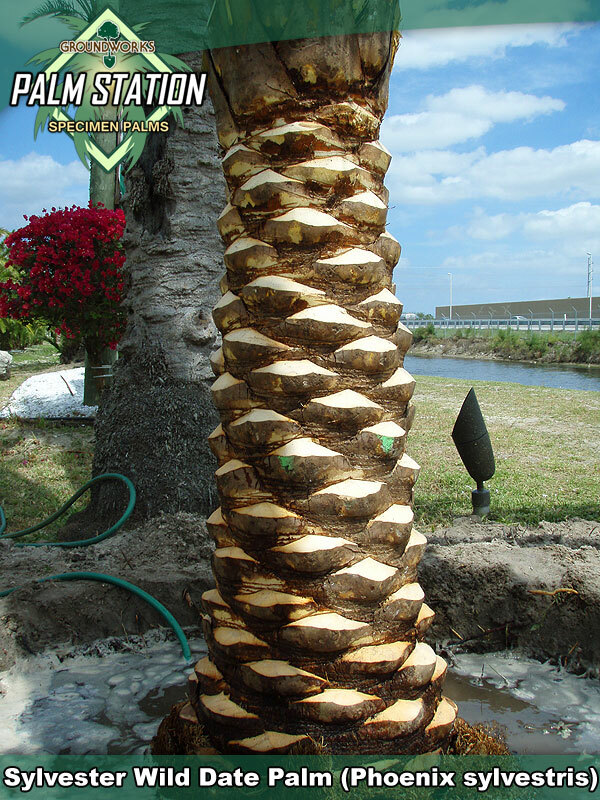 This spectacular palm is often used on luxury properties, golf courses or for avenue plantings. A native to India, Sylvestris have been utilized with great success in Southern Texas, Louisiana, all over Florida and throughout the Caribbean. 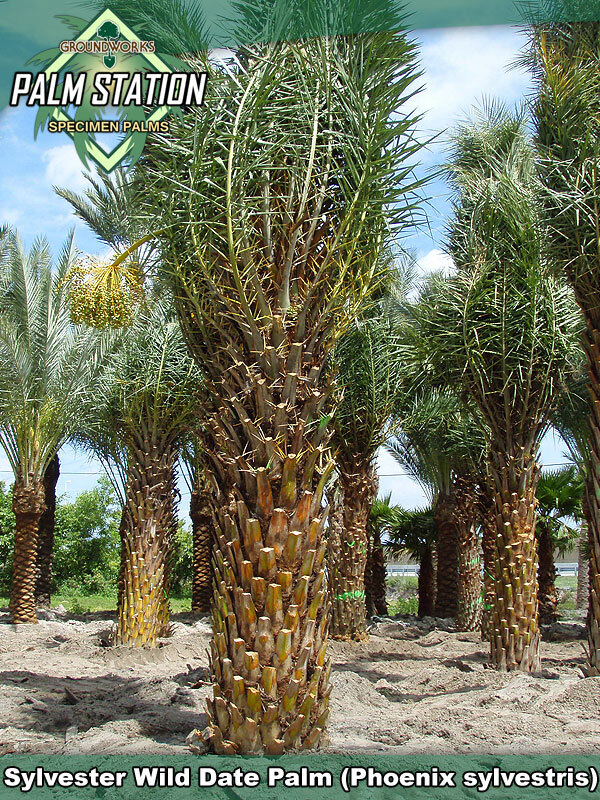 Just like other varieties of date palms, this species requires a lot of water during the first 60 days onsite and good drainage at the surface (upper 18-20 inches of soil layer). Once established, it is fairly drought tolerant and is moderately salt tolerant. Sylvestris grows best in rich but sandy soils and thrives in full sun and partial shade. 8b-11 This species will survive winter freezes down to the high teens provided the freeze durations are fairly short. Freeze damage to the fronds will grow out during a single season. This species will display little or no freeze damage in 26 degree freeze events provided the durations are not prolonged. This species does very well in semi wet conditions as well as in drier scenarios. The rule is that the upper 18" of top soil must be able to cycle wet to dry on a regular basis. Groundworks Texas! and Groundworks Palm Station - Houston have excellent availability of fat, gorgeous specimen Sylvestris palms from 5' to 9' of Clear Trunk. 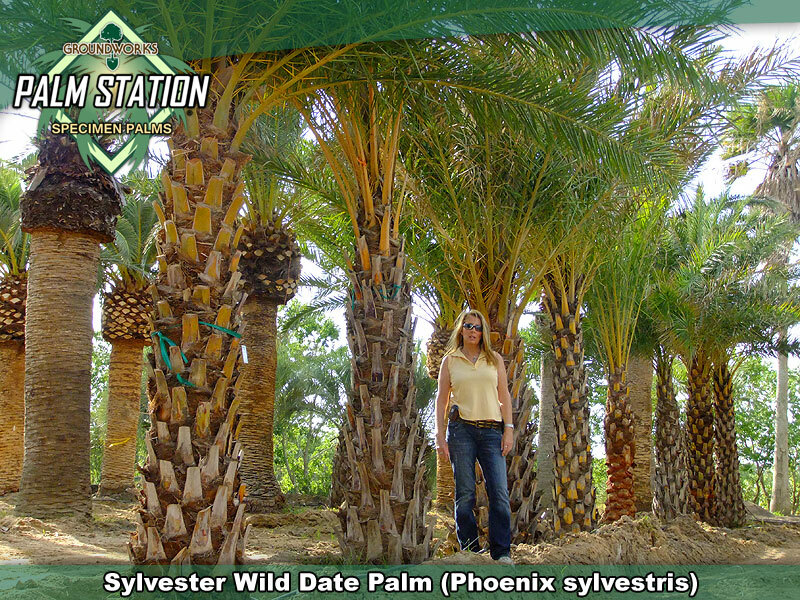 At Groundworks Palm Station in Boynton beach Florida our availability of Specimen Sylvestris runs all the way up to 16' of Clear trunk but this inventory cannot be certified for shipment into Texas.